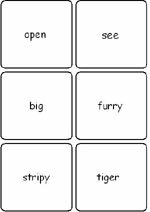 Group Reading and Story Telling can be supported using symbol vocabulary cards which help understanding of the storyline and the sequencing of events in a story. What are vocabulary cards ? Vocabulary cards are laminated word/symbol cards of all the key and new vocabulary in a story. They help pupils to learn new words and support understanding of the story line.